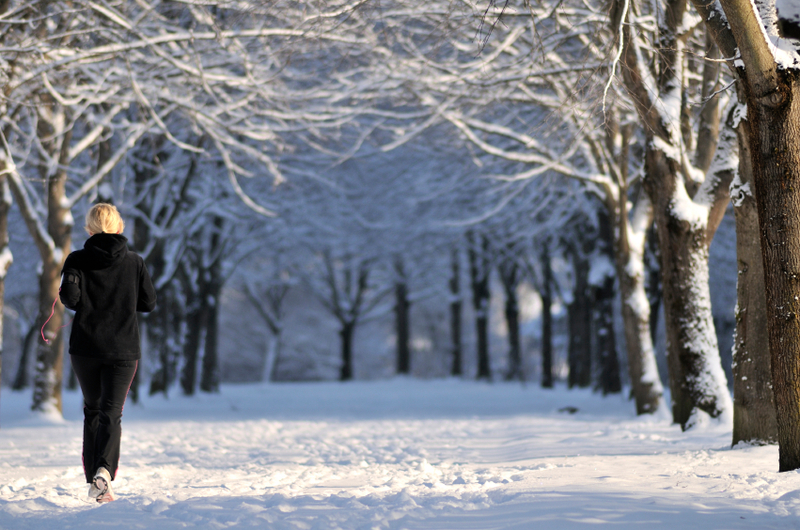 ← 4 Tips to Stay Disaster Free this Holiday Season! Comment below if you are still hanging in there! Let’s continue to encourage each other. I just love the image above. Looking at it literally makes me wish for fresh white powdered snow so that I can be the first to make the tracks. There’s also nothing quite like seeing my warm breath in the cold air and feeling the sun’s rays hit my cheeks. Ahhh, this is winter running at its finest. Then I give myself a reality check and say to myself, “You hate the cold!” It’s amazing how a simple picture can get us motivated, but what actually gets us out the door to run? Honestly, during the Holiday season, running just doesn’t make it on our to-do list. We have ample reasons to procrastinate when it comes to our health: year-end work deadlines, holiday parties, and shopping. So, what do most of us do? Hibernate. We start skipping workouts and start eating what we normally don’t eat. In comes the New Year! Where we’ll decide we have to make a change. But, what if we can prevent hibernation mode before it happens? So, how do we stay committed to our daily routines and still have time for everything else? Well, for starters it takes planning, and secondly, a community with the same goals. The planning you’ll have to do, the community is where we come into play. This year we’ve decided that in order to get through the holidays we need to make a commitment. Our goal is to workout everyday for at least 30 minutes a day. We are calling it, “Chase the Sun.” Starting November 22nd (Thanksgiving day) until New Year 2013 we are making a pledge to go outside and “Chase the Sun”. To help you complete the challenge we are giving away 50 Power Walk apps to the first 50 people who commit to joining. To track your workouts and help you stay focused, sign up for a 30-day trial of RunHelper Connect. Receive weekly workout summaries in your email, post your workouts on Facebook and Twitter, and take advantage of other Connect features. We want you to succeed! Please join us, post a comment below and we’ll send you a free promo code for Power Walk. Am I too late, me and my dog want to chase the sun!! No, it is not too late! I’m so happy you joined us today. I’ll go ahead and send you the promo code for the Power Walk app. Hope you and your furry friend had a good 30 minute workout today. I am in. 30 minutes a day thru Jan 1, 2013. Count me in! I need something to give me an extra motivational jump! I love all thetime motivation and helpful tips i get from you guys! Thanks so much!! This is exactly what i need to get me motivated! Count me in! I am in. I used your apps to start running also. Just sent out 6 more Power Walk app promo codes. Make sure you get the app downloaded and ready to go for Thursday. How else will you preparing for #ChaseTheSun? New shoes? Music? Please share. I’ve been trying to reply at the bottom and it wouldn’t work for me, but I LOVE this idea! I need a community to get me motivated, I’m committing! Looks like you were able to leave a comment. We are happy to have you! I’m in! I just started your Ease into 5k program with a plan to then do the bridge to 10k. My friend (runner) signed me (non runner) up for a 10k in April! Yikes! Here we go! Your friend is awesome! Good luck with your training for the 10K. Your apps got me running! I’m so in. Glad to hear. I am so happy you joined us. I’m really not a fan of cold weather, so I need all the motivation/help I can get – count me in! I’m in. I’ve been fairly good about working klout, but I need to get outside. This is the invitation I’ve been waiting for. The first 25 free versions of Power Walk have been sent via email. I can’t wait to get started, and I’m even more motivated by all these great comments! I commit to Chase the Sun! Count me in for the challenge!! I have been slacking big time. Now that it is nearly summer here in Austalia I really can chase the sun!! Love the imagery of chasing the sun… 30 minutes is totally doable. Thanks! Just what I needed to get me back on track after a hiatus!!!! I’m in, thanks for the motivation, easy to slip in winter time….. Walking back to happiness ………………. I’m in. Chasing the sun sounds like a great way to enjoy winter. Count me I ! I’m taking this challenge. This is just what I need to get back on track. Thanks! Great idea!! I will definitely chase the sun with y’all! I am in to commit to the chase the sun challenge. This is just what I need to keep me motivated. I pledge to “chase the sun”! I’m recovering from a car accident and have barely done any exercise since. Thank you for motivating me into doing a bit each day to get back to healthy! What great timing! I’ve been needing a kick in the pants to do more cardio – it’s gone by the wayside since I’ve started weightlifting. I’m in! Definitely committed to continuing my workouts through the holiday season. I love the Chase the Sun idea! I can commit to this, I have marathon training to get done!! Sign me up! The next few months will be killer, but we will get through it! What great timing! After limited working out since the kids returned to school, I made a pledge to start beginning today (got up at 5:15). This will be one more great motivator/reminder to stay on track! I commit to chasing the sun. I’m not sure what I will do with it when I catch it, though. Have already committed to running 3×10 km runs per week between now and the end of the year so now I will just have to squeeze in another 4×30 minute workouts per week. Time to try a few power walks in between the runs. Wish me luck and. I agree with Kimberly! I’ve been slacking since MAY! Today, I started back running again and I’m really hoping this will be the JUMPSTART I NEED!! Thanks for giving us another outlet for encouragement! Yippee! 🙂 I’ll share this with my FB run/walk group too! They’ll love it! This is a great idea! I’ve been slacking since my tri in Sept. I’m particularly bad when I can’t get a longer workout in–I tend to not do anything. This is a good reminder that anything is better than nothing! Thanks! I would like to commit to this!